Hello, friends!!! Saturday has arrived and that means time for another ODBD Shining the Light challenge. I have a little announcement to make before I get to this week's challenge. This is the last Saturday for the Shining the Light challenge. Starting on July 3rd, the Shining the Light challenge will be moving to Tuesday. All the details can be found here. 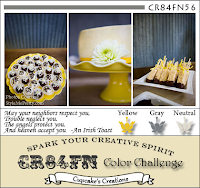 This is also Debi Southard's final post for the challenge team. Debi is moving back over to the design team. As my post title says this week's challenge is "anything goes" meaning we want to see any kind of project using ODBD stamps. How fun is that?? I stuck to the tried and true: a card. Earlier this week I had spent some time working on my project for my Time With Post (found here) and since I was getting inky I decided to use my new acquired ODBD Honeycomb background stamp to do some emboss/resist. I stamped the background using VersaMark ink, applied the embossing powder and heat set it. I then inked up the image using Ranger's Squeezed Lemonade and Scattered Straw inks. I then trimmed the piece to fit my card front. I then stamped the oval from the ODBD Eternity, as well as the sentiment from the same set using Tuxedo Black ink. The image was then die cut using the ODBD/Spellbinders Elegant Oval dies. Some black double stitched ribbon was tied around the background piece and a clock charm (thanks, Sabrina!) attached using some yellow baker's twine. Finally I adhered the oval piece. 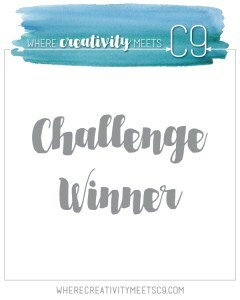 To make the challenge even more fun, we will be giving out a prize, a $15 gift certificate to be used toward stamps at the Our Daily Bread Designs store!! Entries for the prize must be submitted by Friday, July 6th at 8 a.m. EST. One random winner will be chosen and announced next Saturday. 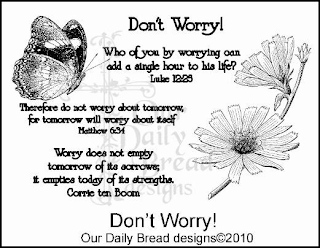 While it is not required to use Our Daily Bread Designs images and sentiments on your creations, we would love to see them if you have them. As a way of recognizing those who do use Our Daily Bread Designs stamps, we will again be choosing three or more of our participants for the Shining the Light Award . In order to qualify for this award or join the challenge, however, you must use Our Daily Bread stamps and have your submission added to Mr. Linky by Friday, July 6th at 8 a.m. EST. If you upload your creations to Splitcoast Stampers or any other online gallery, please use the keyword is ODBDSLC114. When creating your posts on blogs please include a link to the challenge. Thanks for stopping by... please take some time to check out the beautiful projects created by my fellow "sticks" Lori, Jan Marie, Jan, Debi, Kathy, Chris and Sabrina! To join in the fun, please click here. Hello, friends.. going to try to make a quick post here. Have a card I made using sweet Chupa's current Sketchbook Saturday sketch and the colors from the current ColourQ challenge. I just couldn't let the week end without making a card using Chupa's sketch. I just LOVE her sketches!! Anywhooo... on to the card. When I saw the sketch I wasn't too sure what I was going to do, but then when I saw the ColourQ colors I knew I had to use my favorite HA set Bold Pop Designs. I inked up the largest flower in the set using Hero Arts Hero Hues Punch ink and the smaller flower using SU! 's So Saffron. Then both flowers were die cut using the matching dies. I'm still in my white on white mode and so I embossed the background using my PTI Quatrefoil die, added the lace and the ribbon (SU! 's Pacific Point). The circles were die cut using Spellbinders circle dies and then adhered to the card. The bakers twine was added to the grey cord buttons, adhered to the flowers and then the flowers were added to the circle. I die cut the fishtail flag using my MFT Fishtail Flag dies and then stamped the sentiment (also Hero Arts) using Pacific Point ink. Thanks for stopping by and thank you those of you who took the time to comment about my shoulder. It has been feeling better! Supplies: Cardstock: PTI white; SU! Grey; Stamps: Hero Arts; Inks: Hero Arts & Stampin Up! ; Dies: MFT, Spellbinders and Hero Arts; Twine: Twinery; Ribbon & Buttons: Stampin Up! Hello, friends! I have a bright and cheerful card to share with you. The card is for the current Less is More challenge and uses this month's sketch from The Craft's Meow. The Less is More challenge this week is paper piecing. One of my favorite crafting techniques is paper piecing. I had lots of ideas as to what I would do, but since my shoulder is bothering me today I decided to go with a pretty simple paper piecing idea. The color palette for the card is based on patterned paper from Echo Park 6x6 pad called "Hello, Summer". The papers came along with my June Key Ingredients kit from Taylored Expressions. I stamped the open style flower from The Crafts Meow set "Simply Delightful" on some solid pink and orange papers from the pad using dark pink ink. The pink image was trimmed out entirely and then the center from the orange one was trimmed out. The two were adhered using a foam dimensional and the little blue button (also from the KI kit) was added to the center. The tag was diecut from the reverse side of the solid pink paper using my ODBD tag die. The zig-zag piece was die cut using a My Favorite Things die. I cut a 2" square of white cardstock, stamped the sentiment using green ink and then inked to the edges with the same ink to give the piece a bit more definition on the tag. The flower and the zig-zag were then adhered to the tag. It was a bit of a trick to tie the ribbon around the card. Once that was done I adhered the tag using more foam dimensionals and then the entire card piece was attached to the card base. I think there is enough white space to make Chrissie and Mandi happy while following the layout of the sketch. Hello, friends!! Its Saturday and time for another ODBD Shining the Light challenge (ODBDSLC113)! This week we have a challenge for you... use at least 3 different stamps on your project! 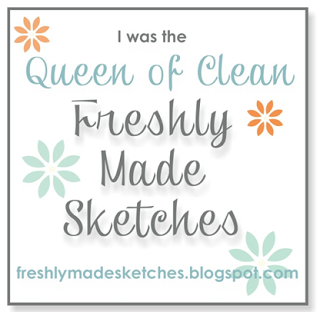 That can include background stamps, images and sentiments. For my card I used the ODBD Brocade Background, as well as multiple stamps from the Simple Things set. The patterned paper I used for the card is from Stampin Up! I stamped the Brocade Background using SU! 's Calipso Coral ink, cut it to fit the card base and then inked the edges with Rangers Old Paper Distress ink. The patterned paper pieces that I used were also distressed with Old Paper ink. The clover image from the Simple Things set was stamped using Pear Pizzazz ink and then die cut using the matching Clover die. Once die cut I also inked the image with Old Paper ink and adhered it to the cream cardstock piece. The bees from Simple Things were stamped on cardstock using Marina Mist ink, trimmed out, inked with Old Paper and then adhered as you see. The patterned paper pieces were adhered to the brocade image and then the lace trim was adhered at the bottom. I inked the edges of the card base as well. The card was finished off with some light blue baker's twine and the sentiment. As with all ODBD challenges we will be giving out a prize, a $15 gift certificate to be used toward stamps at the Our Daily Bread Designs store!! Entries for the prize must be submitted by Friday, June 29th at 8 a.m. EST. One random winner will be chosen and announced next Saturday. If you are not using ODBD stamps, please do not enter more than once. Additional entries that are made without using ODBD stamps will not be commented on nor will they qualify for prizes. While it is not required to use Our Daily Bread Designs images and sentiments on your creations, we would love to see them if you have them. As a way of recognizing those who do use Our Daily Bread Designs stamps, we will again be choosing 1 to 2 creations to spotlight for our Shining the Light Award. In order to qualify for this award, however, you must use Our Daily Bread stamps and have your submission added to Mr. Linky by Friday, June 29th at 8 a.m. EST. 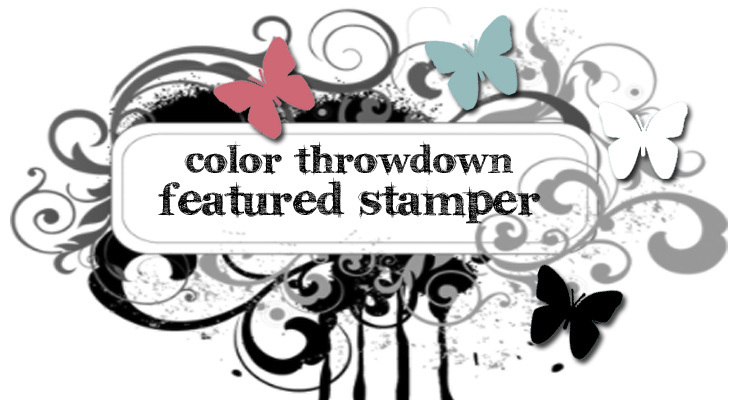 If you upload your creations to Splitcoaststampers or any other online gallery, please use the keyword is ODBDSLC112. When creating your posts on blogs please include a link to the challenge. Thanks for stopping by.... please take some time to check out the beautiful projects created by my fellow "sticks" Lori, Jan Marie, Jan, Debi, Kathy, Chris and Sabrina! To join in the fun, please click here. Supplies: Cardstock: PTI Vintage Cream; PP: Stampin Up! 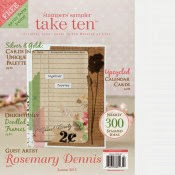 ; Stamps: ODBD Simple Things & Brocade Background; Dies: ODBD Simple Things Die; Lace: Unknown; Ink: Stampin Up! Hello, friends!! Happy Friday! Here with a card for the current One Layer Wednesday challenge (93). OLW is another "just for fun" challenge that I used to do all the time and now I'm trying to get back into the habit of playing along each week. This week Heather Telford is the challenge host and she has asked us to make a one layer card inspired by something in our kitchen. I'm going to be real honest here, but I'm not one of those people who can look at something in their house and make a card based on it. But I decided to have a go since I need to get outside my box. My card was inspired by a bottle of anti-bacterial hand soap from Bath & Body Works. As I looked around my kitchen for something, anything, to inspire me, my eyes zeroed in on that bottle because of the lush pears on the label. The scent of the hand soap is pears and let me tell you that soap really does smell like pears.... so yummy! Anywhoo... inspired by the beautiful pears on the label I got out a Stampin Up! set called "Faith in Nature". All of the images are a kinda collage style and one is of a pear. I stamped the image using Memento Bamboo Leaves and then colored it with Copic markers (after coloring two test images to figure out exactly how to color the pear). The sentiment is from the same set and was stamped using Memento Tuxedo Black. I admit... not super inspired, but I'm trying! Hello, friends! Hope you are having a lovely week. This is the last week for school for my big kid. He has been moping about since last Tuesday (June 12) as that was supposed to be the last day of school. Alas, a teacher strike at the beginning of the school year and an ice storm in January conspired to push back the end of school. While I am a little sad that his summer vacation is a little bit shorter this year, he will get over it! Anywhoo... have a couple of cards that I have made in the last few days. One card is for the current Sketchbook Saturday sketch challenge. I just love that challenge because it is a "just for fun" challenge. 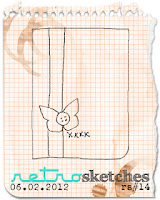 No one is judging your card and you can just take the sketch where you want to go with it. Sweet Chupa envisioned this sketch as a one layer card, but I wasn't in the mood for one layer so I added the additional layer. I'm still in my white on white mood so this one is definitely clean and simple. For this card I also used this week's Splitcoaststampers color challenge: SU! 's Always Artichoke, Cajun Crazy & Chocolate Chip. I don't have the Cajun Crazy color so I used SU! 's Pumpkin Pie instead. The floral image is from Stampin Up! and called "Field Flowers". The sentiment was stamped and then diecut using a My Favorite Things Fishtail Flag Stax die. (I think that die set has officially become my favorite die set of all time!). The it was popped up as shown. 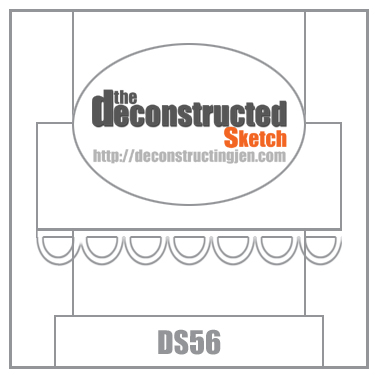 The second card is for Deconstructed Sketch #56. This is also a "just for fun" kinda challenge which is why I was drawn to it as well. For this card I went with a white card base and then added in the color using my Taylored Expressions June Key Ingredients kit. I used the new TE stamp set Delightful Day that was designed to coordinate with the Echo Park Hello, Summer 6x6 pad that is part of the KI kit. The stamp set and the paper pad are absolutely adorable and I can see myself reaching for both of them alot in the future. I should let you know that until July 10th the stamp set is only available to Key Ingredients subscribers. All the cardstock and embellishments are from the kit, as well. I stamped the floral image using Memento Tuxedo Black ink and then colored some of the flowers with Copic markers. Buttons from the kit were adhere to two of the flowers. Overall I pretty happy with the card, except for the little strip at the bottom. I keep thinking that I should have added some patterned paper to it, but then, again, maybe not! Thanks for stopping by... hope your summer is off to a wonderful start!! Hello, friends!! I here with my card for this week's Less is More challenge: Something Shiny. For my shiny I used rhinestones. I actually made this card on Saturday night after an extremely busy day and when I finished it I wasn't that happy with how it turned out, but in the light of a new day it is starting to grow on me! Hello, friends!! Its Saturday and that means time for a new ODBD Shining the Light challenge... YAY!! Summer is here (well sort of in my part of the world!) and that is the theme of this week's challenge. Get out those stamps that feature summertime themes. For my card today I decided to get out my ODBD Porch set because nothing says summer to me more than sitting on your porch with a nice glass of lemonade or iced tea enjoying the day. When I look at the porch image from the set it makes me wish that my front porch looked like that... alas, it does not, sigh! My color scheme comes from the mix of colors from the patterned papers from the My Mind's Eye Fiddlesticks 6x6 pad. 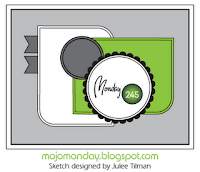 The layout for the card is based on the current Mojo Monday sketch, with just a minor change. I stamped the porch image using Wisteria Wonder a new ink from Stampin Up! and then trimmed it out. The little award sticker is from the Fiddlesticks collection as is the little banner you can see peeking out on the side. I didn't want to cover up the main image so I finished off the interior of the card with the verse from the set. I just love that verse because going to the Lord and spending some time with Him just refreshes your soul like nothing else can. As with all ODBD challenges we will be giving out a prize, a $15 gift certificate to be used toward stamps at the Our Daily Bread Designs store!! Entries for the prize must be submitted by Friday, June 22nd at 8 a.m. EST. One random winner will be chosen and announced next Saturday. If you are not using ODBD stamps, please do not enter more than once. Additional entries that are made without using ODBD stamps will not be commented on nor will they qualify for prizes. While it is not required to use Our Daily Bread Designs images and sentiments on your creations, we would love to see them if you have them. As a way of recognizing those who do use Our Daily Bread Designs stamps, we will again be choosing 1 to 2 creations to spotlight for our Shining the Light Award. In order to qualify for this award, however, you must use Our Daily Bread stamps and have your submission added to Mr. Linky by Friday, June 22nd at 8 a.m. EST. 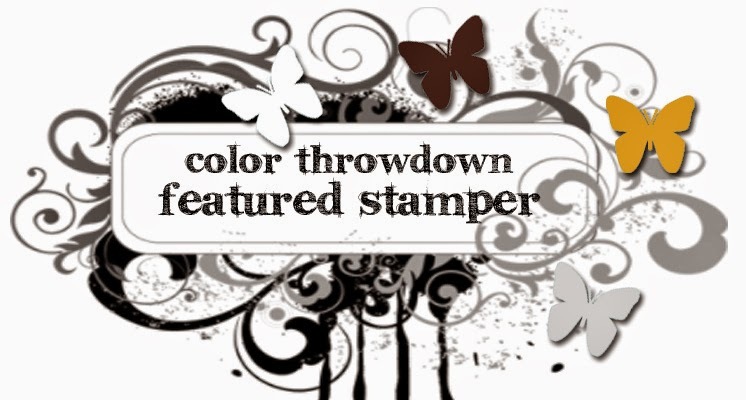 If you upload your creations to Splitcoaststampers or any other online gallery, please use the keyword is ODBDSLC112. 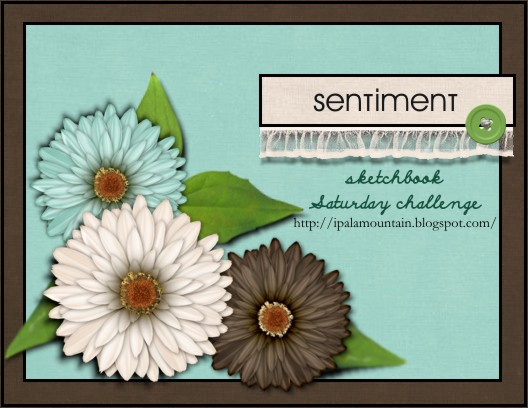 When creating your posts on blogs please include a link to the challenge. Hello, friends!! Today is a special day... today my little one turned 6! I can't believe he is now 6 and going to be starting kindergarten this fall! He is so excited, too. Every time we drive by the school he will be attending he says "mom... there's my kindergarten"! Time is just zipping by.... sigh! Anywhoo... I have a card to share. This one is for the new CASE Study challenge and CR84FN. This is one of those cards that started out with what I thought was a great idea, but I wasn't able to make it work the way I wanted to so I had to move to "plan b". And in retrospect I would not have stamped the floral image on the patterned paper that I used. The flower is just way too busy for me. But I think the card is a nice take on Joy's inspiration card. I decided to use some of my very neglected Penny Black stamps for this card. 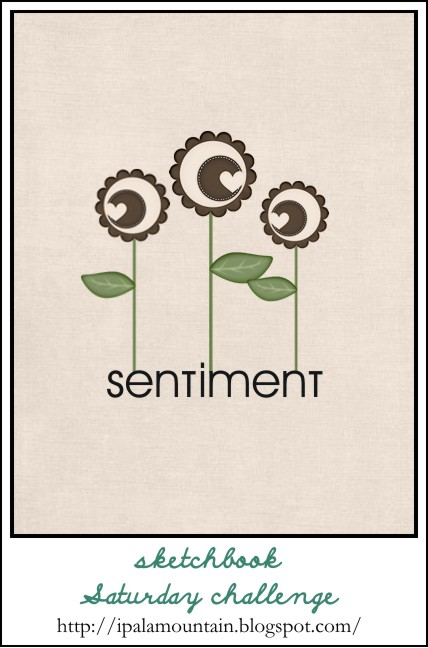 I settled on the floral image "cheerful" and the sentiment "the wind". I stamped the flower on some patterned paper from the Teresa Collins Carolina Breeze 6x6 pad and then trimmed it out. A piece of white card stock was cut in two as shown and the sentiment was stamped on the larger piece. The pieces were adhered using foam dimensionals. I added some rhinestones to the center of the flower and then adhered it to the card using additional foam dimensionals. Some more rhinestones finished off the card. Thanks for stopping by..... and thanks to the ladies at CR84FN for picking my card as one of the top 3 cards for CR84FN 55! Supplies: Card stock: PTI white, SU! Basic Grey; Ink: Memento Tuxedo Black & SU! So Saffron; PP: T. Collins Carolina Breeze; Stamps: Penny Black; Rhinestones: Want2Scrap & SU! Hello, friends! Hope your week is going well. So far so good here, except that the weather is not so great. Hopefully that will change in the next few days. Anywhoo... on to my card. 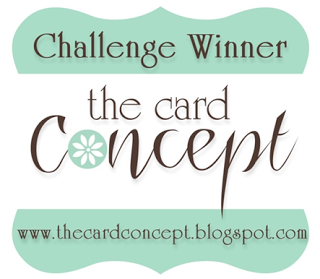 I can't believe it, but I actually got a card done for the current Timeless Tuesday challenge and I got it done on the first day of the challenge! 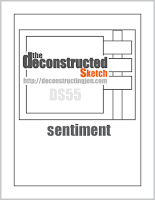 I had been wanting to make a card using the current Deconstructed Sketch and the new TT challenge was the perfect fit. This week the challenge is to make a father's day card. I only have one set from Flourishes that has father's day sentiments in it and that is "What a Catch", so I got that out and went to work. I was also being thrifty today and dug through all my scraps to come up with the patterned papers to use on the card. I believe they are from the My Mind's Eye Breeze 6x6 pad. I had a headache earlier as I was making the card so I decided to keep things simple and not spend the extra time coloring the fish image. But I have to say that I really like how it looks simply stamped using SU! 's Taken with Teal ink. I stamped the word "Dad" on the main image panel and then finished off the inside (sorry didn't take a picture) with additional sentiments from the set that say "You're so fly. Happy Father's Day". Hello, friends! A quick post with a card for Less Is More and Dynamic Duos. This week is one layer week at Less is More. The challenge is to make a one layer card with a flourish on it. When I saw that I had to really think long and hard about what sets I had that might work for the challenge. After looking through some of my set I settled on a Stampin Up! set "Vintage Fresh". It was part of a super cute Sale-A-Bration bundle. I was clever enough to make sure that I was a club hostess during SAB so I could get my hands on that little bundle! 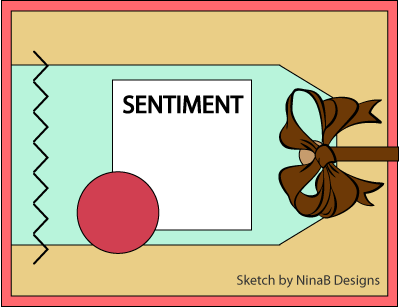 The only problem with the set is that it doesn't contain any sentiments, so I used a sentiment from "Vintage Vogue". Next I had to decide a color combo. 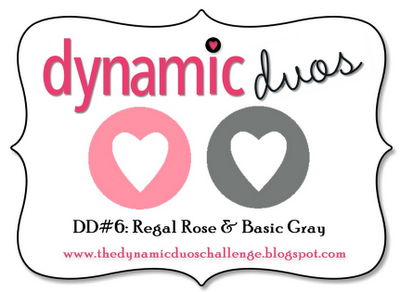 Then I remembered that the new color combo from Dynamic Duos was Regal Rose and Basic Grey and decided to go with that for the card. 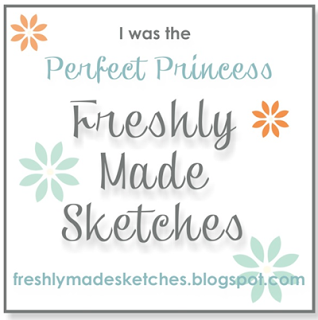 I stamped the flourishy-floral image using Regal Rose and the sentiment using Grey Wool ink from Close to My Heart. I got out my trusty Copic markers and custom colored some pearls in grey and rose to add a little bit of something extra to the card. The layout is one of my tried and true favorites. So, there you have it... another clean and simple card with lots of white space! Something borrowed, something blue! Hello, friends!! Its Saturday and that means time for a new Shining the Light challenge. June is the wedding month and so the challenge this week is to use something old, something new, something borrowed or gifted and something blue! I must admit I had a bit of a time fitting all of those elements into my card... hee! 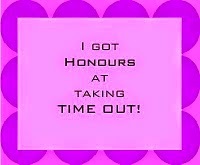 But, I managed to get'er done! My something old on my card is all the distressing I did to make the card appear old and worn. This included using Ranger's Old Paper Distress Ink and my trusty distressing tool! My something new is the newly released ODBD set Bicycle and I covered the something borrowed or gift and something blue all in the same element... the little blue roses sitting in the basket. Those were a gift from my super sweet teamie, Sabrina. I stamped the bicycle image and the sentiment using Memento Rich Cocoa and then the image was colored with Copic markers. Then I got to work inking and distressing all the edges of the cardstock and papers (My Mind's Eye Follow Your Heart... love those papers!! ), adding some well place rips and tears. Once I was done with that I added the little roses and the twine bow. I absolutely love how the card turned out! As with all ODBD challenges we will be giving out a prize, a $15 gift certificate to be used toward stamps at the Our Daily Bread Designs store!! Entries for the prize must be submitted by Friday, June 15th at 8 a.m. EST. One random winner will be chosen and announced next Saturday. If you are not using ODBD stamps, please do not enter more than once. Additional entries that are made without using ODBD stamps will not be commented on nor will they qualify for prizes. While it is not required to use Our Daily Bread Designs images and sentiments on your creations, we would love to see them if you have them. As a way of recognizing those who do use Our Daily Bread Designs stamps, we will again be choosing 1 to 2 creations to spotlight for our Shining the Light Award. In order to qualify for this award, however, you must use Our Daily Bread stamps and have your submission added to Mr. Linky by Friday, June 15th at 8 a.m. EST. If you upload your creations to Splitcoaststampers or any other online gallery, please use the keyword is ODBDSLC111. When creating your posts on blogs please include a link to the challenge. Thanks for stopping by.... please take some time to check out the beautiful projects created by my fellow "sticks" Lori, Jan Marie, Jan, Debi, Kathy,and Chris! To join in the fun, please click here. Hello friends!! A quick post with a card for a couple of challenges: ColourQ and CAS-ual Fridays. ColourQ is one of my favorite challenges, but lately I have just not been doing a very good job of creating cards using the color combos. So, I took a bit of a break and I think the break has helped because I really like the card I made using this week's color combo of Real Red, Island Indigo, Lucky Limeade, Tempting Turquoise & white. 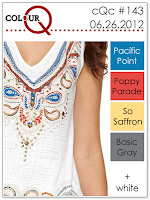 Instead of Lucky Limeade and Island Indigo I used Pacific Point and Kiwi Kiss. The challenge this week at CAS-ual Fridays is to create a card using dots or spots, depending on what you want to call them. 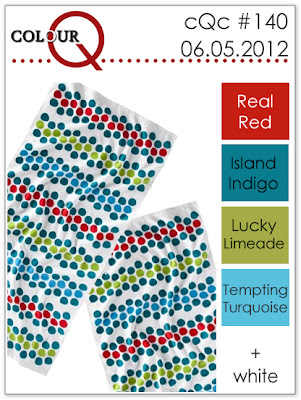 This worked perfectly with the ColourQ challenge because the inspiration photo is of a cool towel covered in dots! So naturally the first stamp set that came to mind was my PTI set Dot Spot. 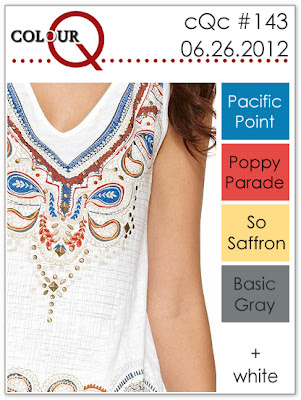 Then I thought of one of my most recent PTI purchases, Background Basics Dots & Spots. But in the end, Dots & Spots just didn't have the look I was going for so I went with Dot Spot. I stamped the largest circle using the Tempting Turquoise ink and then added the smaller circles using the Kiwi Kiss and Pacific Point colors. The sentiment, from Signature Greetings, was stamped using Real Red. I really, really like how the card turned out.... clean and simple a good amount of white space. 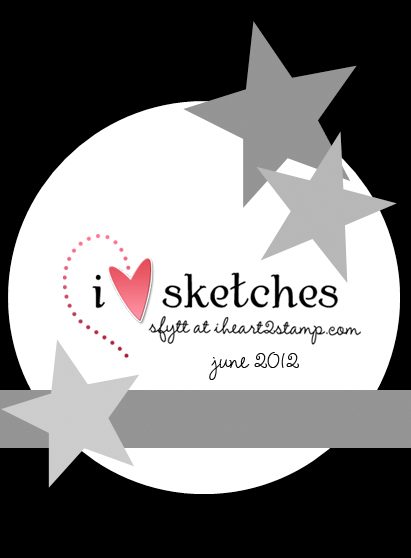 Supplies: Cardstock: PTI white; Stamps: PTI; Inks: Stampin Up! ODBD For the Love of Hop.... Winged Things! Hello, friends!! 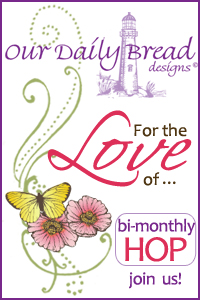 Welcome to Our Daily Bread Designs Alumni Team's bi-monthly For the Love Blog Hop. This week the Alumni team along with some of the ODBD designers are featuring a hop For the Love of ODBD Winged Things! Check out each link and leave a comment. If you get lost along the way, check the ODBD blog for a full list of links. One of the posts is a hop "hot spot" and a name will be drawn from that list of comments to win a $15.00 ODBD store gift certificate. So, all you have to do is hope along and see all the creations and leave a little love! You have until Wednesday, June 20th at 6 pm. Enjoy all the awesome inspiration using For the Love of ODBD Winged Things! If you got here from the blog of the super talented Jan, then you are on the right track For my card I used the ODBD set "Don't Worry". This set contains a beautiful floral image, as well as a beautiful "winged thing"... a butterfly. I decided to go with a pink and green theme for my card. 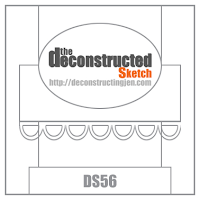 The layout is based on this month's Sketch for You to Try. I stamped the floral image once using SU! 's Pear Pizzazz ink and then a second time using SU! 's Regal Rose. The green image was completely trimmed out. For the pink image I just trimmed out the flower heads. They were adhered to the green image using foam dimensionals. The butterfly was stamped twice using Regal Rose, the entire butterfly trimmed out and then just the wing from the second one which was adhered to the first butterfly. The background was created by using the PTI quatrafoil die to emboss the white cardstock. I used the Memory Box Tessatina border die in the same manner and then die cut it using a Fishtail Flag die from My Favorite Things. Some Pear Pizzazz ruffled ribbon was adhered to the bottom of flag. Spellbinders circle dies were used to cut the white and Regal Rose cardstock. The card was put together as you see and some rhinestone flourishes were added. I also finished off the interior of the card with a verse from the "Don't Worry" set. I used the Tessatina border die on the interior of the cards, as well. Thanks for stopping by.... now off you go to the ODBD blog! Hello, friends!! Seems like ages since I last posted, but it has only been a few days. I'm in a bit of a crafting funk right now and not feeling very creative. Not sure what is going on, but I have been feeling like I need to just take a bit of a creative break. Even though I have been feeling that way I did manage to make a couple of cards today. I will be sharing one in a few days and the other one I'm going to share right now. I made this one for the current Frilly & Funkie challenge to use kraft and twine. When I saw that challenge I just had to play along as I just love creating with kraft cardstock. 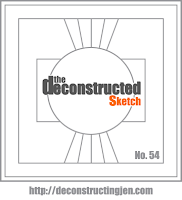 The layout is from the current Deconstructed Sketch (I am really lovin' the Deconstructed Sketches!). I went with a teal, white and kraft combo. This came about based on the patterned papers that I pulled from the My Mind's Eye Follow Your Heart 6x6 pad. All that stamps used are from the Taylored Expressions set Be Amazing. I followed the sketch very closely and kept things very simple. I brought in a bit of funky on the card by using some corrugated cardstock that I got from the Funkie Junkie Etsy shop. A bit of frilly was brought into the project by distressing the edges a bit and adding the little rose to the center of the little butterfly (Part of a little gift that I received with my last purchase from the Funkie Junkie. Please take a moment to check out Linda's shop... she has LOTS of really fun items!). The twine (from PTI) ended up being a bit on the thin side and so I'm not completely satisfied with it, but it is what it is! Hello, friends!! No post today for the ODBD Shining the Light challenge... which is kinda weird for me. 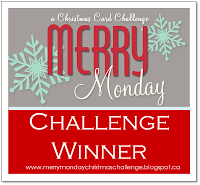 So, thought I would have gotten my card for this week's LIM challenge done and posted by now, but that didn't happen! And my card is such a simple one, too! Anywho... finally getting it posted now. The LIM challenge this week is a color challenge and since England is celebrating the Queen's Diamond Jubilee Chrissie and Mandi thought it very appropriate that the colors be red, white and blue (the colors of the British flag or Union Jack). 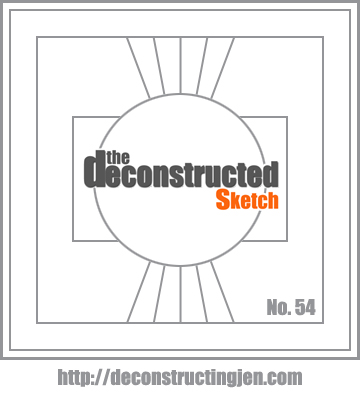 After I saw what the LIM challenge was I roamed around blogland a bit and saw that the new sketch for Retro Sketches had been posted. It was perfect for the LIM challenge. Very clean and super simple. I used a strip of patterned paper from my Taylored Expressions Key Ingredients kit, as well as one of the canvas resist flowers. I inked it up with Barn Door Distress Ink, but felt it wasn't red enough so I added some SU! 's Riding Hood Red to deepen the color. I spritzed the flower with Perfect Pearls Mist to dampen it and make the flower easy to shape a bit. Some red bakers twine was added to the button and then adhered to the center of the flower once it was dry. 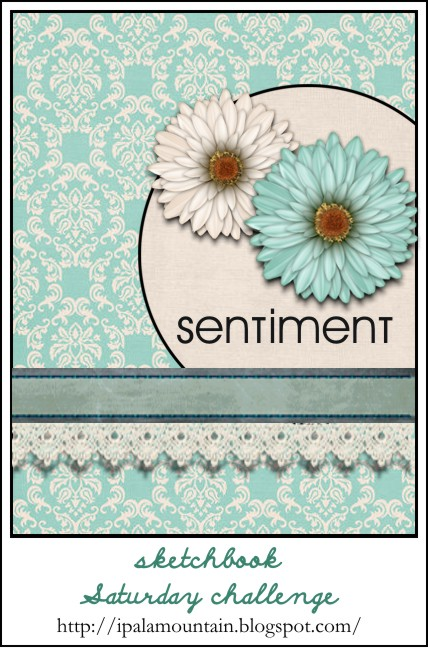 The sentiment "celebrate" is from the TE set Vintage Dreamer. Thanks for stopping by.... think I will try to catch some of the Jubilee celebrations if I can. My paternal grandfather was born in England. King's Lynn, Norfolk to be exact. When he came to the US Queen Victoria was on the throne! When Elizabeth was crowned queen he was in his late 60s, but I'm sure he probably watched her coronation with great interest. I'm sure he would be surprised to know that 60 years later she is still queen!! Hello, friends! Happy Friday! Have a card I made using my Taylored Expressions May Key Ingredients kit. The kit came with these fun little canvas resist flowers and some sweet little buttons. For my card I used two of the flowers and two of the buttons, as well as cardstock and patterned paper from the kit. I like how the card turned out, but honestly it is one of the busiest cards I think I have ever made! There are a whole lot of patterns going on! 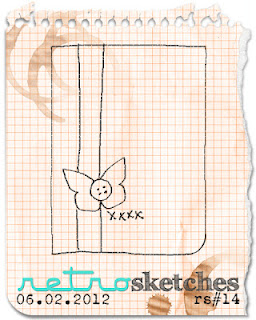 The layout is another lovely sketch provided by Chupa and her really fun Sketchbook Saturday sketch challenge. 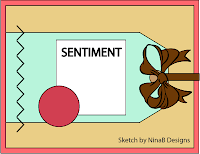 I used some ribbon from the KI kit to create the little ruffle at the bottom of the sentiment strip. The flower was created by using Ranger's Distress inks in Chipped Sapphire and Barn Door. I then sprayed the flowers with Perfect Pearls Mist (Pearl color) to soften up the flowers and allow me to shape them a bit. I threaded some bakers twine through the buttons before adhering them as you see. The leafy branches were die cut using my TE Leafy Branch die. I distressed the edges of everything a bit for a slightly shabby look. I'm going to be putting this card into the current TE Key Ingredients Subscriber Challenge (my first time participating! ).